Veronica Belmont (born July 21, 1982) is the co-host of the Revision3 show Tekzilla alongside Patrick Norton, and host of the monthly PlayStation 3-based video on demand program Qore. Formerly she was the host for the Mahalo Daily podcast and a producer and associate editor for CNET Networks, Inc. where she produced, engineered, and co-hosted the podcast Buzz Out Loud. She also cohosts Sword and Laser with Tom Merritt. From January to April 2012 Veronica and Brian co-hosted Game On! on TWiT, which Justin wrote. 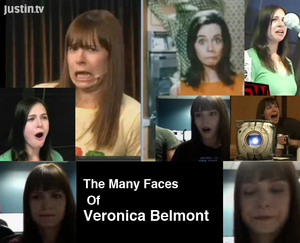 The many faces of Veronica Belmont, the ever expanding collage. #219 - Fire Eating - The Basics! #222 - Fire Eating Part 2: Advanced Vapor Tricks! Veronica has over 1.6 million Twitter followers. Veronica despises Brian after he prompted people on Twitter to put indecent things on the giant video wall at the gdgt party during SXSW on March 15, 2010. Prior to Brian's tweet, Justin had tweeted out, "Saw a Win 7 phone live at the gdgt party. It's Lindsay Lohan in Freaky Friday, pretty and promising but you can already see impending doom". Others retweeted it, causing it to show up on the wall over and over. Brian got a stern talking to when Veronica saw the following tweet on the video wall: gdgt 8====D Not Safe For (Sh)Wood. On April 1, 2012, BBpedia changed to VBpedia. This page was last modified on 5 May 2014, at 13:49. This page has been accessed 22,313 times.